The next day we left the hotel early to begin our journey along the Infinity Loop, the scenic drive that includes the Columbia River Gorge, Mt. Hood, the Oregon Trail and more. Of course we had to begin the day with a stop at Starbucks (thanks to my sweet mom who gave us a gift card to enjoy several chai lattes!). As we drove toward Mt. Hood, we both marveled at the impressive scenery around us – the Cascades lingered in the background, blue skies above. Mt. Hood soon came into our view. Justin and I looked at each other and smiled. We both felt so lucky to be experiencing such beauty and adventure, with each other. 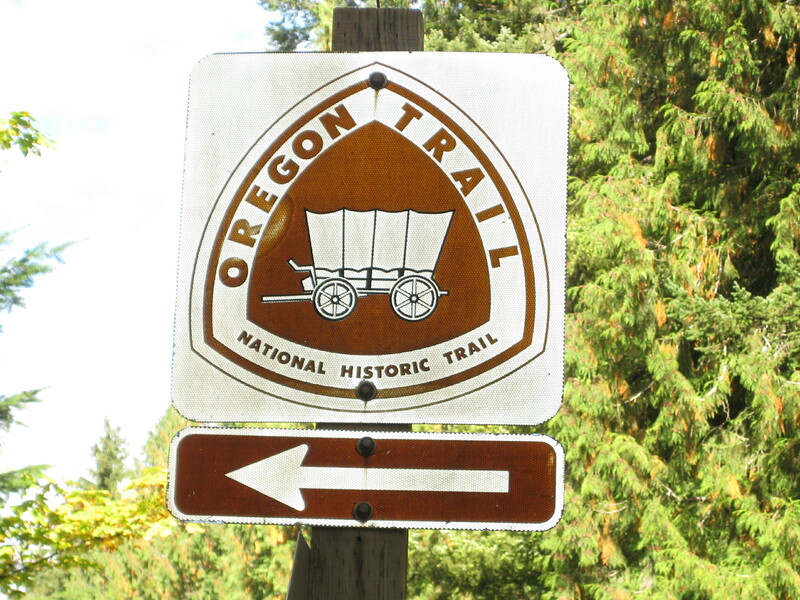 The National Park and Oregon State Parks definitely know how to encourage tourism. There were many information spots and turnouts along the scenic road to pull off to enjoy the scenery and take pictures (considering we took over 400 pictures, you might imagine that we stopped often!). One of our first stops was the historic Oregon Trail, which led to sharing memories and laughs about the popular computer game played by our generations in school. Who remembers this computer game? After driving through several towns, we turned off the highway onto the six-mile road that led to the historic Timberline Lodge, which was built in 1936 during the Great Depression by unemployed craftspeople hired by the Federal Works Progress Administration. Interestingly, construction is currently occurring at the lodge, which is also funded by the federal government as a way to provide jobs in these tough economic times. Justin recalled the outside of the lodge from the movie, The Shining (since I don’t watch scary movies, I haven’t seen this). 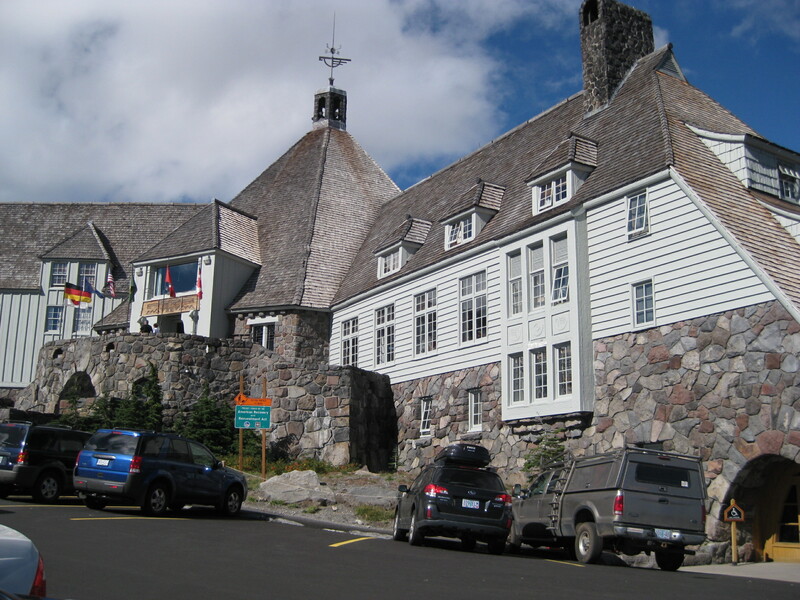 The Timberline Lodge is a beautiful building, built entirely by hand using rocks and timber found in the wilderness. We ate lunch on the third floor and were in awe of the amazing work done so long ago. Timberline Lodge served as the external location for The Shining movie. After a delicious lunch – salmon, cheeses, hummus, fruit, soup and more! – we definitely needed to move our bodies so we hiked up the path behind the lodge toward Mt. Hood. If you turned around the trail, Mt. St. Helens was visible in the distance. Pretty cool. We hiked a bit on the Pacific Crest Trail, then toward Canada for a while before deciding to head back to the Timberline and continue our adventure toward the Columbia River. Along the Columbia River are many waterfalls. There are lots of neat hikes you can go on around each waterfall but we were getting tight on time and wanted to see the Crown Point Vista House before sunset so didn’t stop much. We saw the Bridal Veil Falls and Wahkeena Falls. We stopped at the Multnomah Falls again to enjoy the view. I’m fairly sure that Justin grew weary of me stating, “oh my goodness, it’s so beautiful” most of the day! But seriously, we saw some pretty incredible sights! 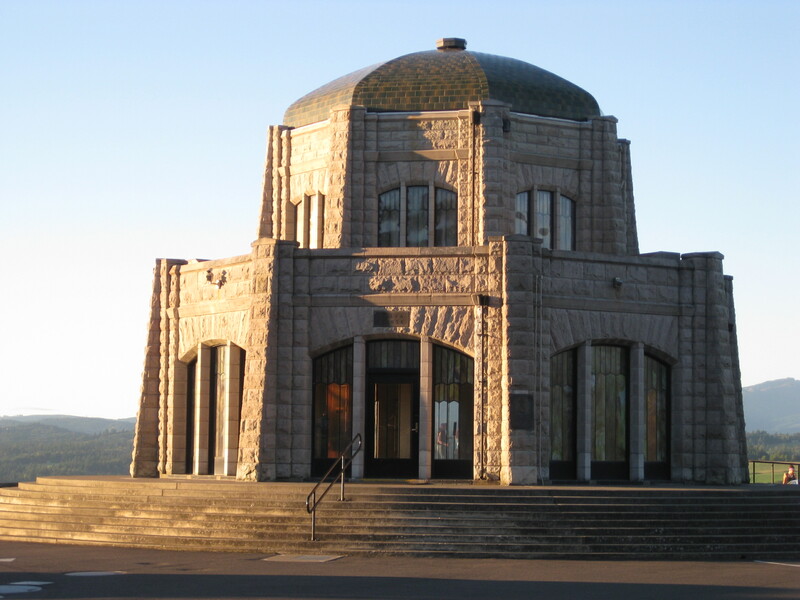 The Crown Point Vista House sits 725 feet above the river and was built as a memorial to the early Oregon pioneers. The views are pretty spectacular. The Vista House itself is an impressive example of architecture with gorgeous stained glass and dimensions. 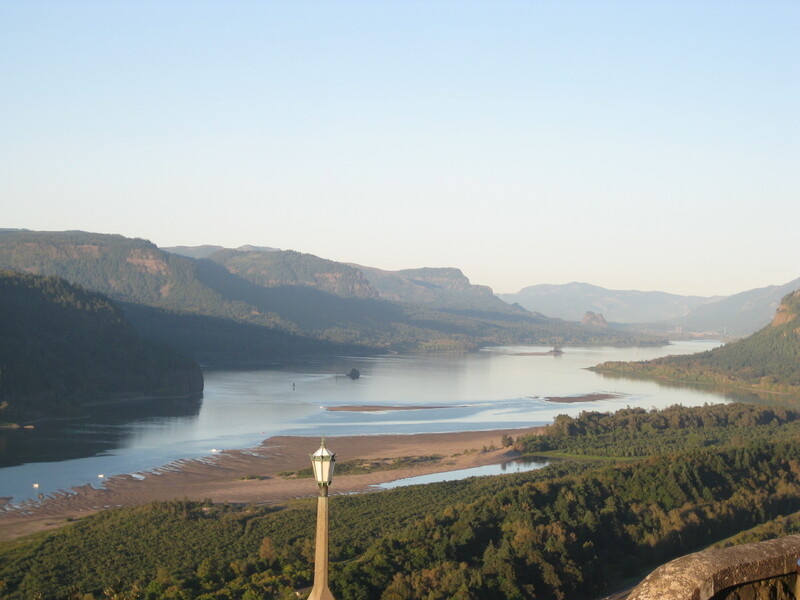 Standing on the steps, overlooking the Columbia River, you are once again struck by how beautiful much of our country is. Crown Point Vista House is 725 feet above the river! It was an awesome day exploring the Infinity Loop. And it ended on even happier note when my very thoughtful boyfriend made a special stop to purchase some Alaskan White Ale and Pyramid Audacious Apricot Wheat. I discovered both of these tasteful beers on a trip to Alaska in 2009 and have been disappointed that neither is available in Michigan. So Justin stocked up for the rest of the week. I admit I thoroughly enjoyed ending the day with a cold, Audacious beer!